On September 1, 2016 Colin Kaepernick would forever change my perspective, and the perception of what it is means to honor our country. “I am not going to stand up to show pride in a flag for a country that oppresses black people and people of color.” “ To me, this is bigger than football and it would be selfish on my part to look the other way, There are bodies in the street, and people getting paid leave and getting away with murder”. In the few weeks since Colin Kaepernick made these statements, there have been at least two more unarmed black men fatally shot by police officers. Even more concerning than the unnecessary loss of black lives at the hands of authority figures, the overwhelming lack of understanding from White Americans, to recognize what it is that Kaepernick is doing. The mistreatment of blacks in America is well documented over the course of hundreds of years. Yet because he makes millions of dollars, he should be grateful and be silent? An athelete tells your child to “say no to drugs,” “stay in school,” or “drink milk to grow big and strong,” and you commend him for being a role model. Why can’t Colin Kaepernick tell that young black kids across the country, it is wrong to be discriminated against? Why is it a problem to acknowledge the imperfections of this great country of ours when it comes to matters of race? I tell you… It is it makes the majority of White America uncomfortable. The protesting of the National Anthem is not about defiance or disrespect. It has absolutely nothing to do with taking for granted of the blood that has been shed in the protecting of our freedoms. However, do you really want to talk to a black person about people fighting and dying for freedom? 1863 was only 153 years ago. My grandmother is will be 70, my great grandmother just turned 90, math is pretty simple. It’s not as if the Emancipation Proclamation was enacted and everything just became instantly better for African Americans. One of the most usurped notions that I’ve encountered is the thought that because slavery and the civil rights movements were “so long ago”, that I am to forget about it. I shouldn’t dwell on the past. To an extent that is correct, however I have a responsibility to remember of the sacrifices of those that came before me, that provided me the opportunity of education, and the right to sit wherever I want on a bus. Just because I am blessed with a good career does not mean I turn a blind eye to what is happening within, and what is being done to my community. THAT is the message Colin Kaepernick is attempting to convey. “Why the National Anthem?” “Why couldn’t he find another way to voice his opinions?” “Kneeling won’t solve anything.” Maybe it won’t, however it has certainly gotten your attention. Like it or not, the conversations being had in itself is already a victory. I dare say when a certain minister had an idea to march a group of individuals in Washington D.C., he was probably met with the same cynical questions. How’d that work out? Certainly I am not comparing the two individuals, but there comes a time when trying to invoke extreme change, extreme actions must be taken. No matter if it is the willingness to be hosed down, or sacrificing endorsement deals, one’s integrity should remain priceless. We now find ourselves in a time where people of color are no longer content. People are tired of the mistreatment, double standards, overall unfairness that black and brown communities are subjected to. The conversations need to be had. In our schools, our churches, in our homes. OURS in a sense on all-inclusiveness. Hatred is not genetic, it is taught. Only through education and decency can we get the message across. Of course there are individuals that would see us separate, both black and white. However, I am not writing this for them. I am writing this to those who want to understand why we are angry, and hurting. I am proud to say that almost all of my white friends have asked me why? But in the previous statement, the phrase ‘almost all’ should stand out to you. There are those that I’ve called friend, bro, that haven’t said a word to me. Especially since I’ve been on record in support of the protest. Kind of funny but that catch phrase of “tell me how you really feel” seems to come to mind now that I think about it. If we are to truly be a forward thinking, progression nation, ultimately we all need to come together as one. However I make no mistake in thinking change will come swift, and without opposition. I saw a photo online of a young black woman protestor being arrested. In the photo she’s wearing a t-shirt that reads “This ain’t yo mama’s civil rights movement.” Up until now, I wasn’t exactly sure what it meant. But given recent events, and the state this country is now in, in terms of race relations, the message is clear… Dear White America WE are no longer afraid. GENOCIDE /ˈjenəˌsīd/ – The deliberate killing of a large group of people, especially those of a particular ethnic group or nation. Colin Kaepernick is a second-string quarterback who seems like he has something to prove. Since he obviously cannot prove that something on the NFL playing field, he decided to show and prove on the sidelines. 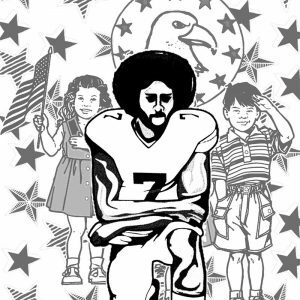 For those who have not watched, heard or discussed Colin Kaepernick in the past few months, Kaepernick is the back-up quarterback for the San Francisco 49ers who decided to protest the malicious, illegal and unjustified, yet unpunished, genocide of unarmed Black people by not humbly and dutifully standing for the singing of our National Anthem during the 2016 NFL preseason. While we recognize the divisive use of his fame and notoriety to stand on his soapbox in front of millions of viewers was his way of expressing extreme distaste for the direction policing is headed on a national level, we must be clear that “policing” is not in the United States Constitution. Therefore any disrespect toward the Stars and Stripes is unpatriotic and unacceptable. Kaepernick should not have “protested” against Old Glory, but rather the national phenomenon that can no longer be seen as a singularity. Now, most of us know that Black lives matter, but do you? Do you think that the lives of Black men matter, or will your life be the same tomorrow if another Black man gets killed today? Some people have so much evil and hatred in their tiny, little hearts that they see no problem with (1) the assassination of unarmed people without cause and (2) the murdering police officers going unpunished for it. While it may hold that those who swore to protect and serve all citizens should at least be imprisoned for a period of time when involved in the shooting of an unarmed person, we can experience no progress by insulting the United States. Disrespecting our Constitution or our National Anthem is deplorable. Rioting, looting and violent reactions are intolerable. Change can only take place in the orderly manner that works best with the system currently in place. In other words, get politically active. Encourage your daughters to be federal judges and national legislators. Encourage your sons to be lawyers and state senators. Teach them that there is only one way for change to transpire, and that is organically from within.